Black U.S. Olympians Won In Nazi Germany Only To Be Overlooked At Home : The Torch Jesse Owens is still the most famous name from the 1936 Olympics in Nazi-controlled Berlin. But a new documentary highlights 17 other African-American athletes who also made their mark. 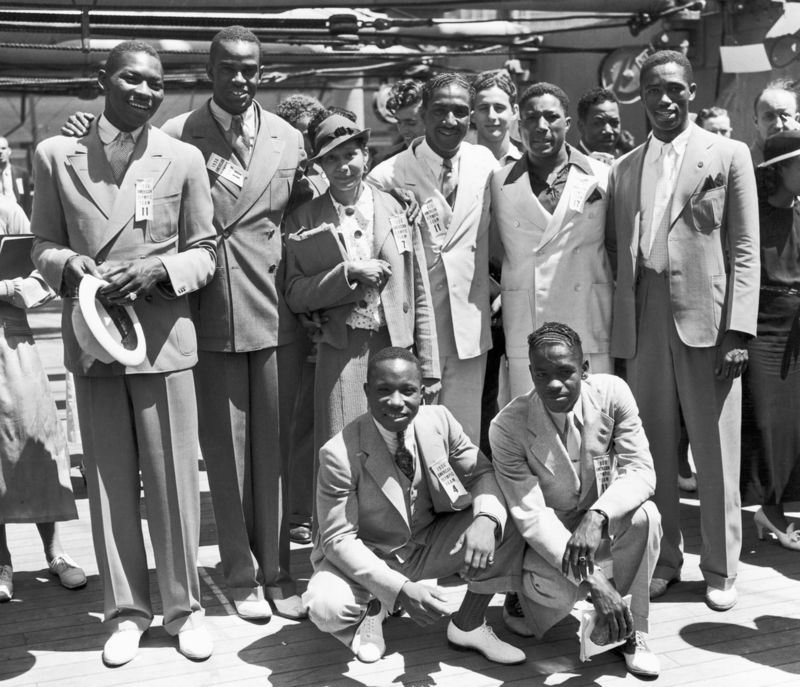 At the 1936 Olympics, 18 black athletes went to Berlin as part of the U.S. team. Pictured here are (left to right, rear) high jumpers Dave Albritton and Cornelius Johnson; hurdler Tidye Pickett; sprinter Ralph Metcalfe; boxer Jim Clark; sprinter Mack Robinson. In front: weightlifter John Terry (left); long jumper John Brooks. Eighty years ago this month, the United States competed in the 1936 Berlin Olympic Games in Nazi Germany, with 18 African-American athletes part of the U.S. squad. 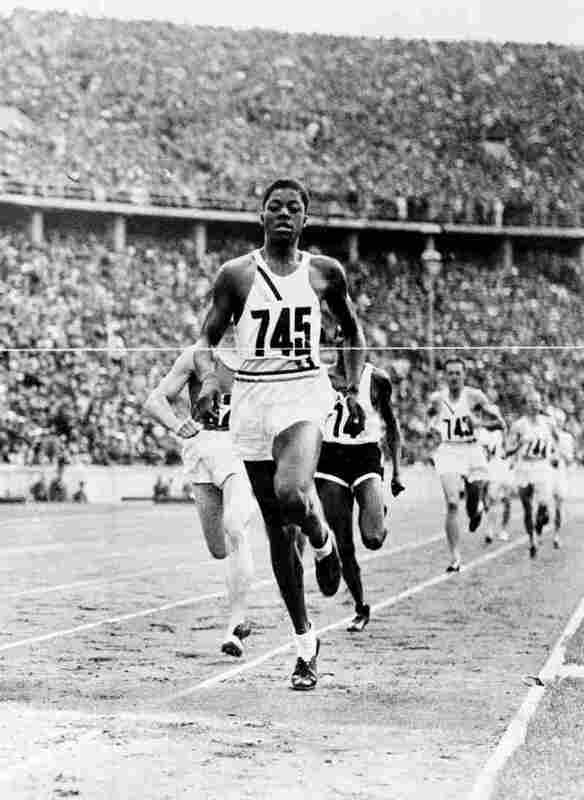 Track star Jesse Owens, one of the greatest Olympians of all time, won four gold medals. What the 17 other African-American Olympians did in Berlin, though, has largely been forgotten — and so too has their rough return home to racial segregation. "Determination! That's what it takes," one of the athletes, John Woodruff, said during a 1996 oral history interview for the U.S. Holocaust Memorial Museum. "A lot of fire in the stomach!" Woodruff won the gold medal in the 800-meter race — and he did it in Adolf Hitler's Germany. "There was very definitely a special feeling in winning the gold medal and being a black man," Woodruff said. "We destroyed his master-race theory whenever we [started] winning those gold medals." Cornelius Johnson won the top spot on the medal stand in the high jump. Dave Albritton won silver. Another medalist was one of Jackie Robinson's older brothers, Mack, who won silver in the 200-meter dash. Future U.S. Rep. Ralph Metcalfe brought home two medals of his own — a silver in the 100 meters and a gold in the 4x100-meter relay. In all, the 18 African-Americans, including Owens, won 14 medals — eight of them gold. That was a quarter of the 56 medals won by the entire U.S. team. Unlike Woodruff and the other African-American medalists, though, two Jewish athletes on the U.S. team did not get a shot at winning any medals. Runners Marty Glickman and Sam Stoller were benched at the last minute and replaced with Owens and Metcalfe in the men's 4x100-meter relay. A similar move took place in 1932, when Tidye Pickett and Louise Stokes became the first black women to qualify for the U.S. team but were later replaced with white runners. Pickett and Stokes were eager to finally compete four years later in Berlin. Pickett did run in the hurdles, but she broke her foot during a semifinal race. Stokes was replaced again with a white teammate. "I think [Stokes] could've been the first black woman to bring home a gold medal for America," says Deborah Riley Draper, who wrote, directed and produced a new documentary called Olympic Pride, American Prejudice. The film includes another story of disappointment: African-American boxer Howell King, who was sent home from Berlin by the U.S. boxing team manager. Supposedly, the decision was because of "homesickness," but Draper says King suspected the manager wanted to replace him with a white boxer. "Howell King himself said, 'I didn't quit! I took a 10-day boat to Berlin. Why would I quit and want to go all the way back to Detroit?' " Draper says. All of the African-American athletes at the 1936 Olympics should be remembered, Draper says, not just Owens. "It was easier to tell the story of one African-American because that's an anomaly," Draper says. "But 18, that's a lot for Jim Crow newspapers to want to report on." The 18 were called "The Black Eagles" by The Pittsburgh Courier, an influential African-American newspaper. In Berlin, they lived in the racially integrated Olympic Village, which was a high point many would never experience again. "They were Olympic athletes when they were on the medal stand," Draper says. "When they came back home to a segregated America, they came back to being Negroes." Some entered academia. Others held elected office. Many struggled to establish stable careers, including Robinson, the silver medalist. He once used his Olympic jacket to keep warm while working as a street sweeper. Still, according to University of Mississippi historian Charles Ross, all the athletes represented a generation of pioneers who chiseled away at stereotypes. "You have to have Jesse Owens and the other 17 African-Americans before you can have John Carlos, [Muhammad] Ali, George Foreman," Ross says. Ross says the 18 African-American Olympians of 1936 understood that their dreams had to be limited. None of them were invited to the White House, or shook the hand of President Franklin Roosevelt. Months after Owens returned home, he told a crowd, "The president didn't even send me a telegram."